Well the local guy was in the mood for some good Cajun New Orleans style food, however, I did not want to fly to the Big Easy. Been there done that many times. So I drove over to The Big Easy. 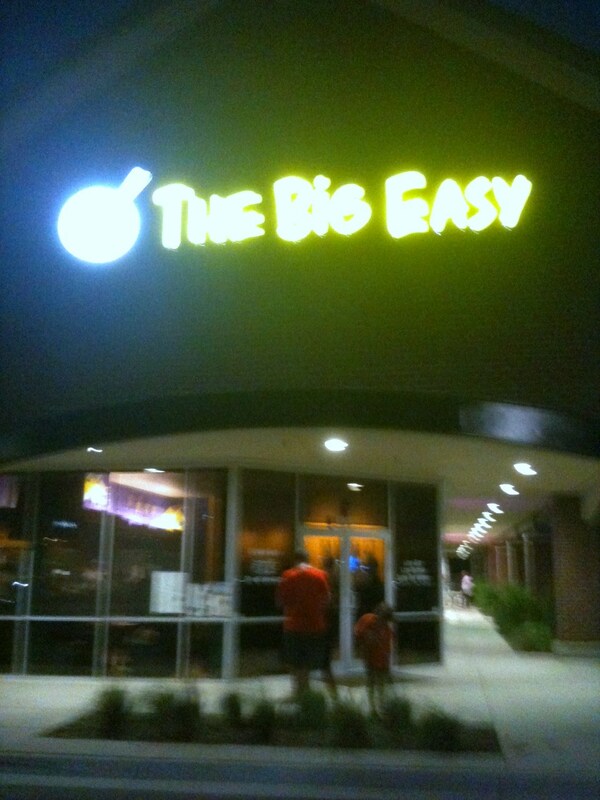 Yes, the new Big Easy in Winter Garden. A friend of mine told me about it and highly recommended it. Well, it did not disappoint. The Big Easy is located down the street from the Stonybrook West community. When you walk in the place it really has a New Orleans vibe. Purple and gold colors all around and genuine New Orleans artifacts all around. I really did feel I was in NOLA. The place has an open kitchen so you see what they are working on, nice set up. The menu has many New Orleans favorites to choose from, starters from gumbos, to Po Boys sandwiches to old specialties like Jambalaya to Etouffee, Red Beans and Rice and fried Cajun seafood. Just a nice New Orleans style home cooking menu for sure. I started off with the Chicken and Sausage Gumbo 8oz $4.99 (comes in bowls sizes only). Like I said I have been to New Orleans and have eaten at NOLA, ACME Oysters, Mothers, Delmonico, Central Grocery just to name a few and the Chicken Sausage Gumbo was the best I have ever had. The dark roux was done perfect. It was accompanied by chicken; andoullie sausage caramelized okra and topped with white rice. The Gumbo had a nice rich spicy taste but not overly spicy that you would have to add hot sauce. For my entrees I had Grandma’s Jambalaya $9.99 and I also had a side of Red Beans and Rice $1.99. Grandma’s Jambalaya consisted of Andouille sausage, chicken, caramelized vegetables with special seasoning and dirty style rice cooked to perfection. I really liked the rice; it was light versus the traditional sticky type of rice. The dish also came with 2 big pieces of freshly made corn bread. You could almost share this dish with another person due to the portion size. The dish was well put together and the flavors were very balanced in spice and consistency. I like the fact you can get the Red Beans & Rice $9.99 entrée as a side for $1.99. The slow cooked red beans were cooked to perfection along with the white rice and smoked andoullie sausage. Spicy in flavor but not too much. Ordered a diet coke and they serve it in a can with ice on the side, no fountain drinks I don’t believe, I love fresh coke out of can vs. fountain style. The service was good and friendly. I noticed a lady dressed business like. She appeared to be the manager or owner? She was working really hard with the serving staff and the kitchen team. She also made sure the place was spotless. They even moved empty tables around and cleaned under them so no trash or garbage existed under the table where guests were dining. I also noticed her wiping down chairs when guests vacated. She was doing a fine job. However, if she was the manager or owner I never observed her going around to the tables and thanking her guests for stopping by. This type of added touch from the management team or ownership just makes you feel even more special about your dining experience. Don’t get me wrong the food is the focal point here and they have the best New Orleans food in Orlando in my opinion. I can’t wait to go back and try some other Big Easy dishes. The Big Easy is in a Publix plaza in Winter Garden. Plenty of parking is available. The Big Easy is open Monday – Thursday 11am- 9pm, Friday and Saturday 11am-10pm. Did not see a website on the menu.